Please visit our website Elsagames.org to play new game Elsa And Rapunzel Back To Schooll for free. As other games, you can play this game in your browser, your mobile and enjoy it for free as well. In this game, you will meet again Elsa and Rapunzel. Today, they must come back to school after the holiday. Very simple to play this game, you just use your mouse and click all the items as you like. In the first game, you must help them to do makeover. You will apply the beauty product and make them nicer. 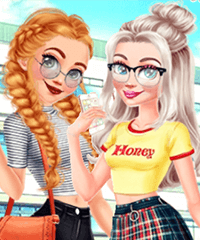 You can use the foundation, moiturizer, face mask, compact powder, Blusher, highlighter, cleansing milk, Mascara, Palette, Eye makeup remover, Eyebrow pencil, Lipstick, Lip gloss and make their eyebrows, eyes shadow, eyes lash, eyes color, blush, lip color,..All games are free and we update new game daily. Besides Elsa games, we have more other games such as descendants games, baby games, My Little Pony games, sailor moon games,..We are here and ready to answer all your questions about our game site and our games systems. Have fun!